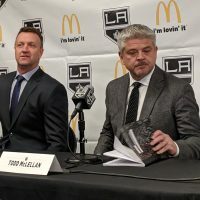 Although the Los Angeles Kings have gone through significant upheaval in their management ranks over the past few months, the 2017 NHL Draft was largely business as usual. 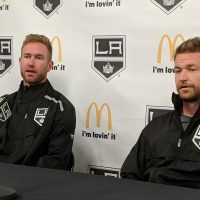 While GM Rob Blake was present at the draft table, the event was largely run by Mark Yannetti, Director of Amateur Scouting – just as it has been in recent years. Even so, there was a different feeling to the two-day event and the meetings that took place in the weeks prior. 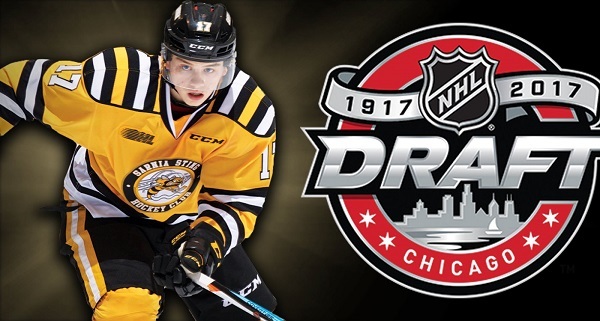 With their only pick in the first round, Los Angeles selected 17-year-old forward Gabriel Vilardi from the Memorial Cup Champion Windsor Spitfires. They tried to move up to get him, as he had been ranked as high as third on some pre-draft rankings. Despite their best efforts to trade up, he still somehow fell to them at No. 11. “The perception is that he dropped because of his skating,” noted Yannetti. “Maybe I’m seeing something that people aren’t seeing. Does his skating need to improve? Yes. Is it a limitation? I don’t see it as a limitation. There is a level of skating that would be worrisome to me, I’ve never seen it with him. Aesthetically, he’s not a pretty skater. Sometimes first reactions are very powerful and hard to overcome. When you first see him skate, it’s not a graceful thing to look at, if I’m being politically correct. That being said, we’re not judging anyone on aesthetics here. His speed allows him to keep up with the faster players in that league. The two fastest junior hockey games I saw last year were the two Memorial Cup games where Windsor played Erie. And he was the best player in each one of those games. I view his skating as not an issue. Similar to the way we viewed Tyler Toffoli’s skating [when he was drafted]. They’re different players and their skating is different, but the reason Toffoli went so late is because of his skating. We knew it needed improving, but it was not a concern for us. Vilardi led his OHL club in goals (29) and points (61) during the regular season. Windsor’s Warren Rychel selected him second overall in the OHL Draft and absolutely raved about him to MayorsManor on Saturday, praising his work ethic and somebody he sees as capable of playing wing or center in the NHL. 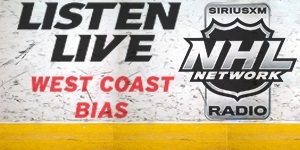 Just caught up w/ Warren Rychel re: Gabe Vilardi – "Hockey rat, never comes off the ice, strongest CHL player from offensive circles down"
In the second round, Yannetti and company selected another 17-year-old forward, Jaret Anderson-Dolan from the WHL Spokane Chiefs. He is said to bring high-end speed and a versatile two-way game. Likely projected as a third line guy in the NHL, Anderson-Dolan could possibly develop into a second line player if he reaches his full potential. Last season, he ranked first in power play goals among Chiefs forwards (14), as well as second in goals, points and game-winning goals (6). He also captained Canada’s U18 World Junior team in 2017. One other interesting tidbit – his head coach in Spokane was Don Nachbaur, the same guy just hired by the Kings to be an Assistant Coach under John Stevens next season. After acknowledging the Kings needed to add some goaltending depth during a MayorsManor interview last week, Yannetti used the Kings third pick (72nd overall) to select Matt Villalta from the Sault Ste. Marie Greyhounds. After being invited to attend the team’s OHL camp as an invitee, all he did was post a 25-3-0 record, along with a .918 save percentage, and 2.41 goals-against average in 33 regular-season games (tops among rookies in all three categories). With a pair of picks in the fourth round, Los Angeles went out to the blueline and selected 5-foot-11 defenseman Michael Anderson and 6-foot Markus Phillips. Last season, Anderson recorded 34 points (5G, 29A) and a plus-29 rating in 54 games with the USHL’s Waterloo Black Hawks. He has committed to attend the University of Minnesota Duluth, beginning with the 2018-2019 season. 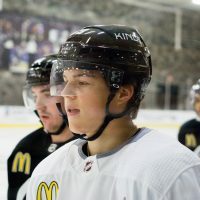 In Phillips, the Kings added a 202-pound defenseman who recorded 43 points (13G, 30A) and a plus-41 rating in 66 games with the OHL’s Owen Sound Attack. 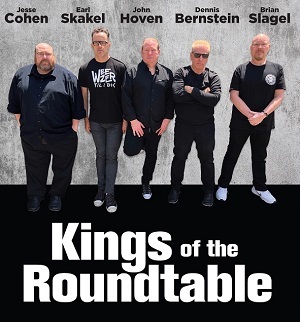 Round five saw the Kings holding another pair of picks. Defenseman Cole Hults heard his name called 134th overall. He racked up 122 penalty minutes in 59 games with the USHL’s Madison Capitols last season, and is headed to Penn State University this fall. 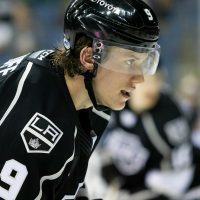 Soon thereafter, forward Drake Rymsha was selected by Los Angeles. His father Andy was a draft pick of the St. Louis Blues back in 1987. Far more interesting is the fact Drake has played for three OHL teams over the past two seasons – the London Knights, Ottawa 67’s, and Sarnia Sting (as pictured above). Scouting him was a bit of a challenge, though, admitted Yannetti. “Obviously with him playing on three teams in a short period of time and the circumstances of the teams he was on it certainly conspires against the kid,” Yannetti told MayorsManor. “You know he went through the draft last year there’s a reason why – (A) he obviously didn’t play well enough to get drafted and (B) his situation and circumstance conspired against him in a crucial year where you’re trying to develop, you’re trying to navigate life you’re least prepared to deal with adversity at the age you’re having to deal with the most. It certainly didn’t help him last year. Although it helped him become the player he was this year because he got through the adversity and once he dealt with it, while it effected his initial draft year negatively, it certainly didn’t effect this year negatively and once he finally fought through that adversity and got on a team where he felt like he was home where now he was kind of in that trusted place he exploded. It certainly doesn’t help playing for just a disjointed season, but even before he found his home in Sarnia, he was still on pace to get 30 goals.